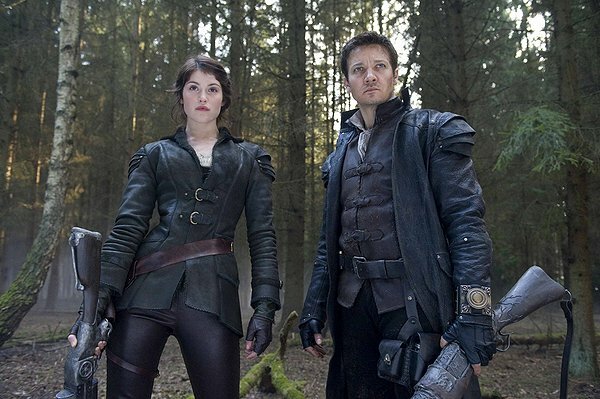 The intriguing premise behind Hansel and Gretel: Witch Hunters doesn’t subsist beyond the first 3-D-enhanced witch chase, a whirling dervish of spells and steampunk that ends with the undead female being punched in the face. That happens a lot in Hansel and Gretel, including during an interrogation scene seemingly lifted from a Zero Dark Thirty storyboard. There's also women (not just witches) repeatedly being beheaded, burned and bullet-riddled. Still, it’s hard to brand this massively fractured fairy tale as misogynistic, for the buckets of three-dimensional viscera it flings at the camera know no gender. 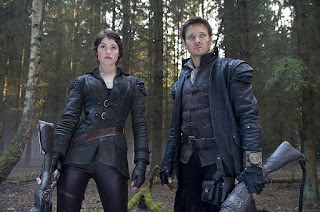 Decades after escaping the clutches of an evil beldam by incinerating her inside the oven of her candy-coated hovel, Hansel (Jeremy Renner, a long way from two Oscar nominations) and Gretel (Gemma Arterton) are grown-up and exacting revenge for their parents’ death. Armed with equally anachronistic weaponry and American accents, the avenging siblings roam the countryside as witch hunters for hire. Writer-director Tommy Wirkola foists just enough flesh, gore and profanity to (intentionally) earn an R-rating, an important fact for any parent lazily considering Hansel and Gretel as their kids’ weekend outing. The periodic F-word is what passes for a punchline in Wirkola’s charmless script. But even the most mature audiences will recoil not merely from the cavalcade of severed limbs and decapitations, but their utter pointlessness within a redundant, meandering plot. There are a smattering of knowing grace notes, like the siblings’ dual reputations as renowned folk heroes and troublemaking mercenaries, and the fact that forced candy consumption during his childhood ordeal with the old witch made Hansel diabetic and requires regular insulin shots. But, the gruesome far outweighs the good. The most unintentionally amusing moment is not when Gretel uses a stun gun to defibrillate a troll (Derek Mears) with a lead foot but a heart of gold, but when the troll reveals his name is "Edward," which through his digitized baritone sounded for a second like “Ed Wood.” In truth, Hansel and Gretel is redolent of another schlock artist—only a movie like this can make the phrase “kitschy Robert Rodriguez knockoff” not seem duplicative.